Researchers at Johns Hopkins published a study that reports that MRI scans CAN cause feelings of dizziness induced by magnetic fields causing motion of the electrically charged fluid of the inner ear. In both ears, there is a "gyroscope" called the labyrinth. Whenever the head turns or a force like gravity is exerted on this system, fluid moves within which tells the brain that motion has occurred. It's much like looking into a glass of water and based on the way the water tilts in the glass, you can guess which way motion is occurring. In any case, the study took two groups of people, one with an intact labyrinth system and another without a functioning labyrinth system. Only those individuals with an intact labyrinth system suffered vertigo while getting an MRI. 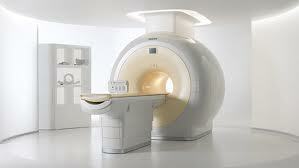 Furthermore, the stronger the MRI's magnetic field, the worse the vertigo. Beyond the "that's interesting" trivia, these results are VERY important in any type of brain activity research. Why? Well, if a person is feeling dizzy, the brain activity you may be studying using the MRI may be attributable to the dizziness itself and the patient's coping mechanisms to deal with it rather than whatever brain activity research you may be investigating. On a more science-fiction note, based on these findings, an MRI can theoretically be used to potentially diagnose and treat dizziness due to the inner ear. After all, if it can cause dizziness, it certainly can be used to help it as well! I have been dizzy, lightheaded for a few days now after the brain MRI. Normal? ?